Not a particularly memorable number, 114, but major newspapers here – among them the Guardian, Independent and the Mirror – and around the world joined in. Why? 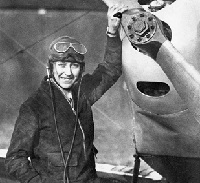 Johnson was the first woman to fly solo from England to Australia, in 1930. She then set records for the fastest flights from Britain to Japan, South Africa and India and became the first person to fly from London to Moscow in a day. Just 75 years after she died after ditching in the Thames Estuary, we have giant aircraft flying large numbers of passengers over huge distances without trouble. EasyJet named an aircraft for her and doubled the number of its woman pilots in its Amy Johnson Flying Initiative. Her face adorns a Norwegian tailplane.